Only 4h 38m 12s left! 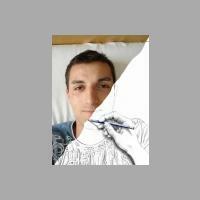 I was born in Germany in 1982, my hobbies are (were) pencil drawings, which later turned to Digital Artworks. It all started with Lego Creator in 2003, were i was just goofing around trying to re-create wrestling scenes. The brick by brick method was easy to me and as i found Bryce i adopted the technique. A few monts later, i discovered Poser, which was at first just like a programm with a marionette (moving limbs and crazy poses). Then i signed on to Renderosity and it all started to make sense ;). I created the backgrounds with Bryce and the characters with Poser. At last i discovered my abilities in Photoshop, were i finally could add some highlights to my creations. I hope u have so much fun in Digital Artworks like i do.